A healthy lifestyle is not just a must for a healthy living, but can also go long mile in preventing head and oral cancers, largely prevalent in India. Stopping tobacco use and adopting a healthy lifestyle can bring down the percentage of such reported cases by a whopping 80 per cent. According to a consolidated report of Bengaluru’s National Centre for Disease Informatics and Research, head and neck cancer cases account for 30 and 10 per cent of total cancers in males and females respectively between 2007 and 2011. Besides, smoking and tobacco use, alcohol consumption is another chief reason cited for the head and neck cancer. The permissible consumption for a male is 40-50 gm a day, while for a female it cannot be more than 10-20 gm a day. Anything in excess can cause you internal organ damage. Oral or mouth cancers are predominant in this cancer category. Many more reasons like personal oral hygiene, ill filling dentures, avoiding repetitive injury inside the mouth by sharp teeth and non-consumption of spicy food and alcohol can also help in curbing these deadly cancers. 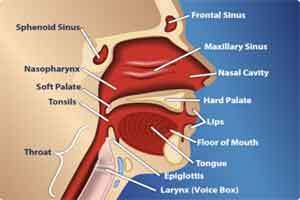 Other major forms of head and neck cancer include lyrangial cancer (voice-box cancer), throat cancer (phyrangial cancer), paranasal sinus cancer (sinus cancer), thyroid and salivary gland cancers. The maximum cases of head and neck cancers are reported from Assam, Bihar and Uttar Pradesh, Rakesh Dhurkhare, consultant for general and laparoscopy surgery at Gurgaon’s Paras Hospitals, pointed out. “Particularly in Assam, about 50 per cent cases of all the cancers are of the head and neck region,” he said. Apaswini Pradhan, senior consultant for surgical oncology at the BLK Super Speciality Hospital said that the maximum number of tongue cancers is reported from Bhopal in Madhya Pradesh, followed by Goa. According to Pradhan, a little attention to diet can also goes a long way in preventing the debilitating conditions. “Deficiency of Vitamin A, C, E, beta-carotene, iron, selenium and zinc can also cause head and neck cancer,” Pradhan said. High-temperature cooking which leads to loss of vitamins, especially vitamin C, should be avoided. “Fresh fruits and vegetables have a known protective effect against these cancers. Preserved meat with high content of nitrates should be avoided,” Pradhan advised. To draw the world’s attention to effective care and control of head and neck cancer, the International Federation of Head and Neck Oncologic Societies (IFHNOS) proposed at its fifth World Congress in New York last year that July 27 be declared World Head Neck Cancer Day. The Union for International Cancer Control (UICC) also supported the move and July 27 will be observed as such from this year.